Even if you’re quite well disposed towards foxes, when pet rabbits are the love of your seven-year-old’s life, you’re hardly likely to want the canids roaming around your back garden. 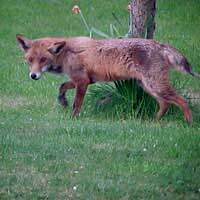 It’s a surprisingly common story, as new housing developments continue to push into what was once countryside, hungry foxes are attracted to the new urban area in search of an easy meal. But as one single-mum discovered, there are ways to deal with the problem. By this time, of course, her daughter was firmly convinced that her beloved pets were soon going to be on the foxes’ dinner menu, so Maggie knew she had to do something – and quickly! “There were lots and lots of tears at bedtime,” she explains. Maggie's first thought was to call her local council, but as she soon found out, although the person she spoke to was very sympathetic and tried to give her as much help as he could, they didn’t actually offer a service to deal with urban foxes. It was a good job that she did. Though they weren’t exactly set up to deal with fox problems either, as luck would have it, the volunteer manning the telephone that day was a retired pest control officer. A few days later, Bob Kingsley came round to assess the situation, and it soon became very clear what could be done to help keep little Pippa’s rabbits out of harm’s way. Although Maggie’s garden was quite small, being on the edge of the small estate, it was surrounded on two sides by open countryside, so there was plenty of opportunity for foxes to get in along the perimeter. In any case, truly fox-proof fencing can work out to be a hideously expensive option – not least because a fox on a mission can be a very determined animal indeed. That was part one of their strategy; part two involved a bit of a surprise as a back-up. Recognising that the repellent might not be enough on its own to make sure the foxes didn’t return, particularly if they were to breed and have extra mouths to feed, Bob recommended a deterrent device which they sourced from the local garden centre. It’s a PIR-driven, motion sensor that attaches to the garden hosepipe. Once a fox – or anything else – comes into its range, it delivers a quick cold blast of water. Even if it misses the fox, the shock should send the startled animal scarpering, and the bunnies, of course, stay safe. “I call it the ultimate deterrent!” Maggie laughs – and so far, it seems to be working. And the rabbits? Apparently they’ve been breeding, so it doesn’t sound as if they’re too anxious about things, now does it?